Alma Speed Fox (b. 1923) was born in Cleveland, Ohio and moved to Pittsburgh in 1949 when she married Gerald Fox. 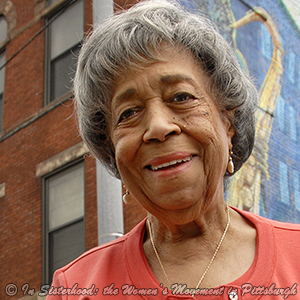 Ms. Fox became actively involved in the Pittsburgh Branch of the NAACP in the 1950s when she joined in demonstrations against the Duquesne Light Company and participated in virtually every march from Freedom Corner since it was established in the 1960s. She was employed as Executive Director of the NAACP (1966-1971) and as Eastern area equal opportunity manager for the U.S. Department of Interior, Bureau of Mines (1971-1983). Ms. Fox also served on the Pittsburgh Human Relations Commission (1972-2002). Ms. Fox organized a major demonstration against Sears and Roebuck in 1968 demanding access to jobs and credit for Blacks. The demonstrations began in the spring and continued through the winter. Several members of the newly formed Greater Pittsburgh Area chapter of the NOW had been members of the NAACP and joined with the protesters on the picket lines. These NOW members had shown themselves to be sincere friends. But, when they invited Ms. Fox to join NOW, her initial response was: “I have one revolution going on, I don’t need another” (Fox, 2008). But, through her friends, she said “I got a different idea about discrimination, the greater idea of discrimination. So, I became very active with NOW” (Fox, 2008). She was co-convener and President of the East Hills NOW chapter, Co-Chair of the Governor’s Commission on the Status of Women and the Pennsylvania Women’s Political Caucus, and a member of the national NOW board. Ms. Fox served as a Pennsylvania delegate to the National Women’s Conference (1978). In 2007, she received the Wilma Scott Heide Pioneer Feminist Award from Pennsylvania NOW for her pioneering work to advance equal rights for both Blacks and women. She remains active in the community as executive vice-president of Freedom Unlimited, which she co-founded in 1968, and as a member of the boards of the NAACP and Gwen’s Girls.